The inspiration for this stems from our school. After lots of brain storming we came up with the idea for the ir board because of the smart boards that are everywhere in our school. 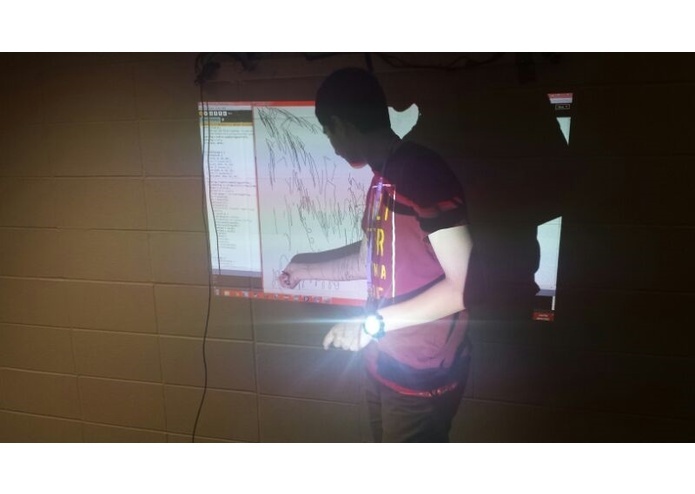 We realized some problems that a smart board could cause such as expenses, and so we decided to challenge that. We have a total of 6 infrared sensors mounted onto our wood beam, each sensors viewing angle is 33 degrees so with 6 arranged in the two top corners we can cover over 90 degrees for a distance of about 3 meters. these sensors pick up IR light and spit out information so we use an arduino to process this information and give us coordinates with the coordinates and some more processing we are able to complete a few different functions. Our first one being our drawing program and secondly a cursor program that allows you to point and click similar to the left click of your average mouse. 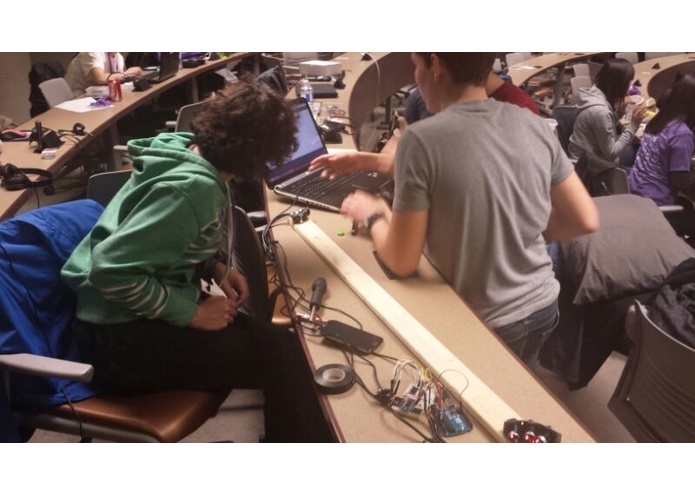 Of course we don't use mouses so instead we developed a wand with two IR lights to send out light in the direction of the sensors and in turn operates our IR Board. If we listed 3 main problems we were pretty much always run into it would be inaccuracies, calibration issues and also hardware problems. These were the biggest and most annoying problems to overcome but we are able to say that we have done a pretty good job at minimizing these problems from occurring. Another main challenge would have to be our resources. Although we came prepared we didn't have access to better IR lights which we believe could have made a big difference in our project. It's safe to say we have all learned a good deal during our first hackathon. We learned lots of different things like what's it's like to not sleep for 36 hours. But of course we learned lots about teamwork, dedication, and lots about our hardware/software and how it works. 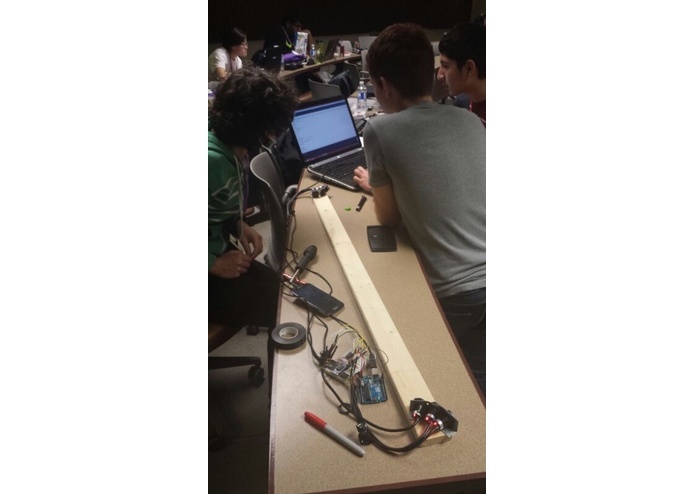 For all of us this was our very first hackathon and we were super excited to learn and experience what a hackathon is like and hack western has with no doubt accomplished this goal. We definitely have tons of improvements, modifications, and extra features in mind. To list only a few is somewhat hard since we consider our hack to be far from a finished product. We aren't saying that this project isn't done, for hackathon purposes it's essentially complete but we have ideas, plans, and ambition that could take this product into the market for schools and other educators. To be more specific some improvements we would like to make include, a better wand with a better IR light emitter that has a much larger dispersion angle, improved software for higher accuracy and more features, and also better and cleaner hardware to give the IR Board a proper finished feel.